Project Panther is a middle school transition camp for rising 7th graders, and we are eager to open our doors for your student this summer! Learn more and register! View Principal Mitchell's Message to the Community! View our school bell schedule! Learn about our after school program! 'Common Sense Education' Recognizes Stone! 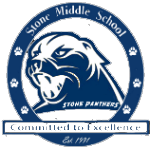 Stone Middle School has recently been approved as a Common School, an honor that recognizes our efforts in teaching digital citizenship to young people and engaging the entire school community in this important discussion. The recognition acknowledges our schools commitment to helping students think critically and use technology responsibly to learn, create, and participate. Ms. Muir, Ms. Bowden, and Ms. Tracy Recognized at FCPS Honors! Congratulations to Librarian Lisa Muir, Instructional Assistant Helen Bowden, and School-Based Technology Specialist Meaghan Tracy who were recognized at the 2018 FCPS Honors Ceremony! For more than a decade, he helped the military defend against biological and chemical weapons. Now he teaches middle school science. Three high schools are among the 100 best high schools teaching personal finance as recognized by Working in Support of Education (W!se), an educational nonprofit organization. A story by a Jackson Middle student in the engineering journal ESFStream was cited in an article published by the Harvard University Graduate School of Arts and Sciences. Students are practicing acceptance, enjoying activities in physical education, meeting authors, and performing onstage in today's photo gallery.